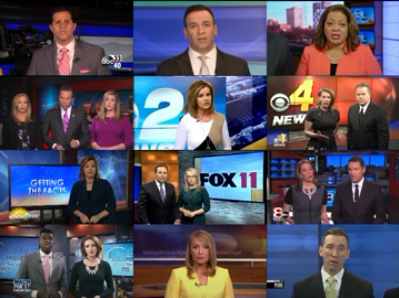 Here's how they demonstrate freedom of speech these days: TV news readers all reciting the same exact speech, about reporters avoiding political manipulation. (B) Our greatest responsibility is to serve our (AREA OF U.S.) communities. We are extremely proud of the quality, balanced journalism that (STATION) News produces. (B) At (STATION) it’s our responsibility to pursue and report the truth. We understand Truth is neither politically ‘left nor right.’ Our commitment to factual reporting is the foundation of our credibility, now more than ever. (A) But we are human and sometimes our reporting might fall short. If you believe our coverage is unfair please reach out to us by going to (WEBSITE) and clicking on CONTENT CONCERNS. We value your comments. We will respond back to you.